Ghorbani, A., Naghibi, F., Mosaddegh, M. (2006). Ethnobotany, Ethnopharmacology and Drug Discovery. Iranian Journal of Pharmaceutical Sciences, 2(2), 109-118. Abdolbaset Ghorbani; Farzaneh Naghibi; Mahmoud Mosaddegh. "Ethnobotany, Ethnopharmacology and Drug Discovery". Iranian Journal of Pharmaceutical Sciences, 2, 2, 2006, 109-118. Ghorbani, A., Naghibi, F., Mosaddegh, M. (2006). 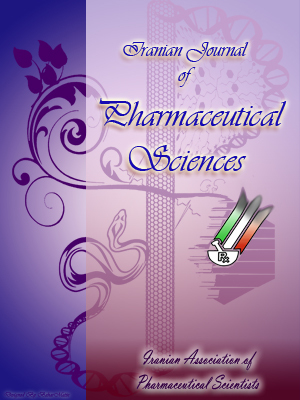 'Ethnobotany, Ethnopharmacology and Drug Discovery', Iranian Journal of Pharmaceutical Sciences, 2(2), pp. 109-118. Ghorbani, A., Naghibi, F., Mosaddegh, M. Ethnobotany, Ethnopharmacology and Drug Discovery. Iranian Journal of Pharmaceutical Sciences, 2006; 2(2): 109-118. This manuscript is a review of a number of ethnobotany and ethnopharmacology texts and papers in order to arrive at current understanding and scope of ethnobotany and ethnopharmacology. It includes either a brief definition of both fields and presenting some examples on them. Also it has a glimpse on the geographical coverage of research works throughout the world, important issue of property rights and state of these fields in Iran. Throughout human history, people used various materials from nature to cure their illnesses and improved their health. Substances were derived from flora, fauna and mineral sources located in people’s immediate surroundings but also in remote areas . Nature has been the source of medicinal agents for thousands of years, and an impressive number of modern drugs have been isolated from natural sources, many based on their use in traditional medicine. These plant based traditional medical systems continue to play an essential role in health care, with about 80% of the world’s inhabitants relying mainly on traditional medicines for their primary health care , though medicinal plants form the principle component of traditional medicine. Medicinal folklore over the years has proved to be an invaluable guide in the present day screening of drugs. Many important modern drugs like digitoxin, reserpine, tubocurarine, ephedrine, ergometrine, atropine, vinblastine and aspirin have been discovered by following leads from the folk uses . Farnsworth and colleagues indicated that globally there were 119 compounds from 90 plants which were used as single entity medical agents. Significantly, 77% of these were obtained as a result of examining the plants, based on ethnomedical uses and are employed in manners that approximate those uses . In recent years, we have called attention to the lack of information on the relative importance of a medicinal plant (or other useful plants) within a culture and the need for comparing the use of plants inter-culturally. Such studies have important implications for research in the field of natural products, since these ethnobotanical studies point out to the species which most urgently should be studied phytochemically and which we consider them to be the most likely ones to contain bioactive compounds. Indigenous people use a wide range of plants therapeutically to maintain their health. There is great promise for new drug discovery based on traditional plant uses. Also, plants may be used as food, and it is difficult to draw a line between these two groups; food may be medicine and vice versa . The loss of language and traditional knowledge due to acculturation and plant habitat destruction is a major concern, particularly among smaller and more vulnerable tribes and indigenous groups. Serious dangers exist for the survival of such people and their cultures and the ecosystems which nurture them and provide western and traditional medicine with novel plant products for human well-being everywhere. Loss of indigenous knowledge has an impact on the modern medicine. As indigenous cultures become increasingly fragmented and threatened by modern development pressures in developing countries, folk knowledge may be lost for ever. Like the current spasm of plant and animal species extinction, the practitioners of ethnomedicine appear to be at a great risk of extinction than even forests and other biomes. Knowledge of the use of plants is disappearing faster than themselves . In this race against ecosystem destruction, researchers in many disciplines must rally to provide the impetus to save global diversity while at the same time accelerating studies of ethnomedicine in consort with biomedical and chemical terms for developing new natural products and drugs needed by humans. It behooves us to study the practice of indigenous populations before they are lost, through either human indifference or our relentless ability to change and destroy the vegetation around us. We hope that this writing will stimulate those interested in ethnobotany, ethnopharmacology and human welfare to look closely and seriously at the data awaiting our scrutiny. The term ethnobotany was first introduced by American botanist John Harshberger in 1896 as “the study of plant use by humans”. Ethnobotany studies the relationship between humans and plants in all its complexity and is generally based on a detailed observation and study of the use a society makes of plants, including all the beliefs and cultural practices associated with this use. It is useful for ethnobotanists to live with indigenous people, to share the everyday life of their community and, of course, to respect the underlying cultures. Ethnobotanists have a responsibility both to scientific community and to the indigenous cultures. The discipline of ethnobotany is a much broader discipline which is interested in all studies about the relationship between people and plants. Ethnobotany focuses not only on medicinal plants, but also on other natural products derived from nature, such as: food, plants used in rituals, coloring agents, fiber plants, poisons, fertilizers, building materials for houses, household items, boat, etc. .
Because plants play an important role in almost every realm of human activity, ethnobotany encompasses many fields including botany, biochemistry, pharmacognosy, toxicology, medicine, nutrition, agriculture, ecology, evolution, comparative religion, sociology, anthropology, linguistics, cognitive studies, history and archeology. The multidisciplinary nature of ethnobotany allows for a wide array of approaches and applications and leaves the way open for many scientists to study the plant uses in different ways . But medicinal plants have always been the main research interests of ethnobotany and the study of these resources has also made significant contributions to the theoretical development of the field . It is clear that inter- and multidisciplinary approaches can lead to more fruitful, thorough and systemic approximations in the study of plant-people interactions. Despite or perhaps because of its many challenges, ethnobotany remains a fascinating and promising area of study . Some wild plant resources are severely threatened by habitat loss and species-selective overexploitation. In addition, indigenous knowledge about the use of wild plant resources is rapidly disappearing from traditional communities. In the context of conservation and sustainable and equitable use of wild plant resources, quantitative ethno-botany can contribute to the scientific base for management decisions. In order to enhance the indicative value of ethnobotanical studies, there have been attempts in recent years to improve the traditional compilation-style approach through incorporating suitable quantitative methods of research in ethnobotanical data collection, processing and interpretation. Such quantitative approaches aim to describe the variables quantitatively and analyze the observed patterns in the study, besides testing hypotheses statistically. The concept of quantitative ethnobotany coined out in 1987 by Prance and co-workers. It is defined as “the application of quantitative techniques to the direct analysis of contemporary plant use data”. Quantification and associated hypothesis-testing help to generate quality information. The techniques used in this respect include, cluster and principal analysis, regression analysis, analysis of variance and log-linear modeling [8-10]. Besides developing quantitative methods, ethnobotany has moved towards a wider approach, including other aspects of the natural world. Ethnobotanists quite often identify themselves more and more as ethno-biologists or ethnoecologists because these disciplines offer more opportunities to analyze human interactions with the overall environment as well as people’s relation to external factors such as the impact of tread systems on local economics and ways of life. Since 1992, the people and plants initiative has coined the phrase “applied ethnobotany” which actually relates to studies and methods which enable work with the knowledge holders in a participatory way, to analyze knowledge and set up improved management systems which build on local sets of practices and social dynamics. Applied ethnobotany also strives to bridge the gap between traditional knowledge and scientific knowledge and to understand the relationship between local practices and knowledge systems and policies, rules and economic trends at the national and international level . Recently, the term ethnoecology has coined out. Martine (1995) describes ethnoecology as a discipline which integrates many diverse academic fields. The term ethnoecology is used to encompass all studies which describe local people’s interaction with the natural environment, including subdisciplines such as ethnobiology, ethnobotany, ethnoentomology and ethnozoology . In fact ethnoecology is the science of how people understand the relationship between humans, animals, plants and physical elements of a locale . Ethnopharmacology as a specifically designated field of research has a relatively short history. The term was first used in 1967 in the title of a book on hallucinogens. The observation, identification, description and experimental investigation of the ingredients, and the effects of the ingredients, and the effects of such indigenous drugs is a truly interdisciplinary field of research which is very important in the study of traditional medicine. Ethnopharmacology is defined as “the interdisciplinary scientific exploration of biologically active agents traditionally employed or observed by man”. This definition draws attention to the bioscientific study of indigenous drugs but does not explicitly address the issue of searching for new drugs. Medicinal plants are important elements of indigenous medical systems in many parts of the world, and these resources are usually regarded as a part of traditional knowledge of a culture . Four general types of herbal medicine exist which are Asian, European, Indigenous and Non-Western. Many like the Asian and European systems go back thousands of years, appear in the pharmacopoeia, and with such a tradition of use are better understood than those of indigenous origins that are often only orally or secondarily recorded. Indigenous medical systems are the most diverse and are still practiced where such cultures are intact, but are continuously evolving as contact with other cultures continuous. The knowledge may reside exclusively with traditional healers, or be generally known . Studies dealing with medical and other useful plants and their bioactive compounds have used many concepts and methodologies. These are interdisciplinary or multidiscipli-nary studies but the relative lack of progress in interdisciplinary and applied domains derives in part from the fact that ethnophar-macologists represent diverse intellectual traditions most prominently pharmacology, anthropology and botany. In addition, some are connected to commercial enterprises, including the pharmaceutical industry and the rapidly expanding market for herbals and medicinal foods. Will it be possible in future to use those combined voices to forge a more interdisciplinary field of inquiry, i.e. how realistic is the vision that calls for an ethnopharmacology that yields collaboration among different researchers as well as the application of that knowledge to practical ends for both scientific and indigenous communities . Chondrodendron tomentosum Ruiz and Pavon; other species of the Menispermanceae (Curarea spp. and Abuta spp.) and Loganiaceae (Strychnos spp.) are also used in the production of curares of varying types . Another example is drown from ethnobotanical work in Turkmen Sahra area in north-east of Iran, with Turkmen people. Turkmens use the seeds of Salvia viridis L. (Lamiaceae) for treatment of inflammatory eye diseases and cleansing eyes from dusts and straws . The seeds are approximately 2 mm wide and 3 mm long; and people use them directly to the eyes, but before using, seeds are soaked in water or milk for about 1 h or so and then applied. At the first glance, this seems an unlikely remedy for eye problems, but the rationale behind it becomes evident when considering the morphological and chemical makeup. The genus Salvia is well known for having the property of ‘Myxocarpy’ (production of mucilage when getting wet), even it could be considered as a taxonomic character. The mucilaginous layer around the seeds contains complex polysaccharides which form a soft layer around seeds. This layer may well have a cleansing effect, and polysaccharides are known to be useful in the treatment of inflammatory conditions and bacterial or viral infections. Although there are no pharmacological data from experimental studies available to corroborate this use, information on the histochemical structure of the seed make it likely that the treatment has some scientific basis. Discovery of reserpine from a traditional medicinal plant (Rauvolfia serpentina) is very interesting. This plant which is called Chota-chand in Hindi, have been used by local people of Himalayan Mountains for snakebite. A local legend claims that in ancient times mangooses were observed to feed on the plant before engaging in combat with cobra. Copying the reputed activity of the mangoos, local people found that the shrub could serve as a potent antidote to snakebite. In Bihar Province of India people use the plant to treat insanity, epilepsy and insomnia . Reserpine isolated from Rauvolfia is a potent drug for hypertension. Interestingly, there is a similar legend among Turkmens of Iran concerning a different plant, Verbascum, called Segher-ghureg in Turkmeni. Verbascum species are also used to treat snakebites . Despite the Rauvolfia which finally captured the attention of scientists, Verbascum sp. are still waiting for scientists to have a closer and detailed look on them. Also, ethnophar-macology as a science bridging the gap between natural sciences and anthropology, should look at symbolic and cognitive aspects. People may select plants because of their specific pharmacological properties, but also because of the symbolic power they may believe is in a plant. Understanding these aspects requires cognitive and symbolic analysis of field data . Another example from field studies in Turkmen Sahra area is the use of the seeds of Peganum harmala L. for evil eye. The seeds are known to contain a variety of alkaloides, but these seeds are not taken by the local people, instead they are grilled and smoked; and believed that the smoke of seeds is a powerful symbol for repealing evil eyes and as a part of the healing process. One more example is the use of tubers of Leontice leontopetalum L. subsp. ewersmannii (Bunge.) Coode. People believe that the plant exist as male and female and men should use the tubers of female plants and women should use the tubers of male plant, otherwise the plant has no effect . The role of ethnopharmacology can be extended beyond that defined previously. It looks not only at empirical aspects of indigenous and popular plant use, but also at the cognitive foundations of this use. Only if these issues are to be included will it be a truly interdisciplinary field of research . Bioprospecting focuses on the development of new drugs for huge markets of the Northern hemisphere. Potentially, highly profitable pharmaceutical products are developed, based on the biological and chemical diversity of the various ecosystems of the earth; this requires an enormous financial input. The search starts with the collection of biogenic samples (plants, fungi, other micro-organisms and animals), progresses through analysis of the chemical, biological and pharmacological activities to the development of drug templates or new drugs. A key process in this search is high-throughput screening systems such as those that have been established by major international pharmaceutical companies. Huge libraries of compounds (and sometimes extracts) are screened for biological activity against specific targets. Active natural products are only one of the many sources of material for these batteries of tests but serve as a starting point for drug development. Currently, some companies envision screening 500000 samples a week against a single target; thus it becomes essential to have an enormous number of chemically diverse samples available. In bioprospecting programs, which are directed specifically towards infectious diseases, the use of ethnobotanical information is very useful and promising. Ethnobotanical studies generally result in the documentation of a rather limited set of well-documented useful plants, mostly medicinal, but also those known to be toxic or used in nutrition. In ethnopharmacology, an important goal is the development of improved preparations for use by local people. Thus it is essential to obtain information on the bioactive compounds from these plants, their relative contribution to the effects of the extract (including for example, synergic or antagonistic effects), the toxicological profile of the extract and its constituents. By restricting ethnopharmacology to the bioscientific study of indigenous uses, attention is drowning to the need for improving indigenous phytochemical systems, especially in developing countries. This requires research strategies for studying indigenous medical plants and their uses. Truly multidisciplinary research on the medicinal plants requires the inclusion of other methodologies from such fields as medical or pharmaceutical anthropology or sociology. Not only do we need a detailed understanding, incorporating social scientific and bioscientific methods, but we also need to support all means available of making better use of these products. subject of research. A survey of publication on ethnobotany in Malaysia has shown the rank order of popularity of themes as: Medicinal plants (57%), general ethnobotany (23%), edible plants (8%), culture, customs and beliefs (5%), indigenous crafts (3%), home-gardens (2%), household items and clothing (1%), and spices (1%). Modern ethnobotany in China can be rooted in research beginning in the early 1960s on utilization of wild plants and on traditional medicine. The Barefoot Doctor Program, starting in late 1960s and which aimed to bring more effective medical services to the masses, was accompanied by a national inventory of Traditional Chinese Medicine (TCM) . Etkin has analyzed the content of the Journal of Ethnopharmacology and Pharmaceutical Biology to discern the extent to which ethnopharmacologists from diverse disciplines share a vision of what ethnophar-macology is. As it is shown on Table 2, this content analysis reveals that very few truly interdisciplinary works combined pharma-cologic data with sufficient ethnographic depth to make substantive statements about how specific plants influence the health of a particular population, have been submitted in these two journals. Interdisciplinary works differ from the primarily pharmacology studies by including ethnographic data of sufficient depth to generate and test hypotheses and to make substantive statements about medical plant use in actual human populations. The point is that interdisciplinary studies effectively combine ethnography and pharmacology to formulate meaningful conclusions regarding how local healers effect cure, how chemosensory properties of plants influence their indigenous medicinal uses and how phytochemical knowledge might be applied in the formulations of new pharma-ceuticals that could serve local needs as well as those of western science. They reveal the complementarities of ethnographic and pharmacologic data, to offer insights into how healing is constructed and efficacy evaluated in particular human cultural context . aData presented from Hamilton et al., 2003; Martinez, 1994. Rank order: 1: highest; N: study by nationals; n: none; F:study by non-nationals. Out of 250,000 higher plant species which are believed to exist on the earth, only few have been thoroughly studied for their therapeutic potential. Five different approaches of selecting plants for pharmacological screening are known, namely, random approach, which involves the collection of all plants found in the study area, phytochemical targeting, which entails the collection of all members of a plant family known to be rich in bioactive compounds, the ethnodirected sampling approach, based on traditional medicinal uses of a plant, chemotaxonomic approach, and a method based on specific plant parts, such as seeds . Khafagi investigated the antimicrobial activity of Sinai Peninsula plants collected randomly versus those collected based on ethnomedical uses. Antimicrobial activity of these plant extracts screened against G+ and G- bacteria, yeast and two dermatophytic fungi. The results of his work revealed that about 83.3% of plants collected by ethno-directed approach showed antimicrobial activity while only 41.7% of plants collected randomly showed antimicrobial action. Ethnodirected plant selection approach demonstrated higher percentage of test results of species with antimicrobial activity either way as compared to random selection approach. However, both ethnodirected and random selection approach may serve as a useful strategy in the search for biologically active compounds with potential antimicrobial activity . It is reasonable to conduct eth-nobotanically directed research in order to optimize the search for novel pharmaceuticals. Random selection approach may also be useful for the identification of the presence of bioactive compounds from plants with unknown folk medicinal use, but ethnobotanical approach is believed to be the best and giving the highest chances to success for many reasons. However, the ethno-directed approach is intimately connected with the assays that will be used later to study the plants. Also to test the ethnobotanical sampling hypothesis, one should collect and test two groups of plants, one group should be collected randomly and the other should be collected based on the ethnomedical knowledge. Comparisons of the test results between the random collection and the ethnobotanical collection can be used to validate the usefulness of the ethnobotanical approach . Who will be the primary recipient of whatever benefit natural products research offer, the West, where much of the pharmacologic research is conducted or people of the developing world who continue to bear the greater disease burden at the same time that they are the source of many of botanicals being tested . Indigenous and traditional people have made major contribution to the enhancement and conservation of the world’s biodiversity. Although this is increasingly recognized in international discourse, rights of these people to continue their traditional practices are threatened by the globalize economy. In order to counter these threats, we need not only to strengthen the rights of indigenous and traditional people, but also to reverse global trends that substitute economic and utilitarian models for the holistic concept of the sacred balance . One of the most contentious areas in natural products chemistry and biology at this time is that of intellectual property rights. Long before the Convention on Biological Diversity, the so-called Earth Summit, it was recognized that countries had the right, within their legal boundaries, of ownership of their biological property, both marine and terrestrial, and that indigenous people also had the right to protect and seek compensation for the knowledge which they had developed, over the generations, based on their local biodiversity. Convention on Biological Diversity (CBD) codified many of these intellectual property concerns and also instructed nations to develop plans to catalog and preserve their biodiversity and their indigenous knowledge. We should consider the rights of source nations and even source indigenous groups over their provided knowledge and genetic materials found within their boundaries. Before conducting ethnobotanical research, it is essential to obtain agreements among all parties, addressing prior informed consent, confiden-tiality ownership of intellectual property and tangible biological materials, collecting and scope, conservation of medicinal plants and habitats, responsibilities of parties, benefit sharing, compensation due to parties at all stages of research, development, and commer-cialization and supplier of materials. Ethnobotany and ethnopharmacology are newly emerging fields of inquiry which are getting more attention from scientific community in Iran in recent years. There are some published works in these two fields and mostly in ethnopharmacology. One of the earliest ethnobotanical works that we could name here is a work by Hopper and Field  on useful plants and drugs of Iran and Iraq which was a market survey of medicinal plants in Tehran, Esfahan and Baghdad markets. Shokir and Safaian  also presented a list of 210 medicinal plants used in Mazandaran province. In a study titled “Iranian medicinal plants and antiparasitic compounds: from ethnobotany to contemporary scientific evidence”, Sairafianpour  has done a medical ethnobotany and ethnopharmacology work for plants with potential anti-plasmodial properties. An ethnobotanical work in Turkmen Sahra area in north of Iran has been conducted by the first author of this paper recording ethnobotanical information of Turkmen ethnic people . Also there is a dozen of unpublished works by anthropolo-gists and in anthropology departments which most of them are compiling of lists of useful plants, namely medicinal ones. Miraldi et al. indicated that there is little literature on the traditional or medicinal plants of Iran. During their excursions in the west Azerbaijan villages neighboring the Turkish border, Miraldi et al. reported a rich flora and extensive knowledge. However, since they also interviewed drug sellers and herbalists in the regional markets besides native people, the information reported may possibly be a mixture of both folkloric and Unani medicines . Comprehensive field expeditions throughout Iran may yield a higher rate of folk remedies than that of what is known today. One interesting point about the situation of ethnobotany in Iran is that botanists are not really involved in this field of inquiry, even though botany is one of the basic fields involved in interdisciplinary field of ethnobotany. Most of the works in Iran have been done by pharmacognosists and anthro-pologists. Improvement of ethnobotany and ethnopharmacology in Iran needs more involvement of botanist in these fields especially the former and also application of quantitative methods not only for compilation of lists of useful plant or just medicinal ones but also for understanding the rational and cultural sets behind these uses. Because of the interdisciplinary nature of these fields, few individuals can be expected to be experts in all components of the cross-disciplinary research that ethnobotany represents in botany, anthropology, pharmacology, chemistry, linguistics and medicine. Therefore, it needs a close cooperation and multidiscipli-nary teams of researchers of different professionals from botany, pharmacology, anthropology and medicine. It is clear that inter- and multidisciplinary approaches can lead to more fruitful, thorough and systematic approximations in the study of plant-people interactions . Lev E, Amar Z. Ethnopharamcological survey of traditional drugs sold in Israel at the end of 20th century. J Ethnopharmacol 2000; 72: 191-205. Whorld Health Organization. WHO Traditional Medicine Strategy 2002-2005. Geneva. http://www.who.int/medicines/library/trm/trm_str at_eng.pdf. Anyinam C. Ecology and Ethnomedicine: Exploring links between current environmental crisis and indigenous medical practices. Soc Sci Med 1995; 4: 321-9. Cordell G. Biodiversity and drug discovery: A symbiotic relationship. Phytochemistry 2000; 55: 463-80. Pieroni A. Medicinal plants and food medicines in the folk traditions of the upper Lucca Province, Italy. J Ethnopharmacol 2000; 70: 235–73. Heinrich M, Barnes J, Gibbons S, Williamson EM. Fundamental pharmacognosy phytotherapy. London: Churchill Livingstone, 2004; pp. 24-5. Alexiades NM. Selected guidelines for ethnobotanical research: a field manual. New York: The New York Botanical Garden, 1996. Höft M, Barik SK, Lykke AM. Quantitative ethnobotany. Applications of multivariate and statistical analyses in ethnobotany. People and plants working paper 6. UNESCO, Paris, 1999. Peters CM. Beyond nomenclature and use: a review of ecological methods for ethnobotanists. In: M.N. Alexiades (editor), Selected guidelines for ethnobotanical research. New York: The New York Botanical Garden, 1996; pp. 241-276. Phillis O, Gentry A. The useful plants of Tambo Pata, Peru: I. statistical hypothesis tests with a new quantitative thechnique. Economic Botany 1993; 47: 15-32. Aumeeruddy-Thomas Y, Pei Shengji. Applied Ethnobotany: Casestudies from the Himalayan region. People and plants working paper 12. WWF, Godalming, UK, 2003. Martin GJ. Ethnobotany: A methods manual. London: Chapman & Hall, 1995. Davidson-Hunt I. Ecological ethnobotany: Stumbling toward new practices and paradigms. MASA J 2000; 16: 1-13. Elvine-lewis M. Should we be concerned about herbal remedies? J Ethnopharmacol 2001; 75: 141-4. Etkin NC. Perspective in ethnopharmacology: Forging a closer link between bioscience and traditional empirical knowledge. J Ethnopharmacol 2001; 76: 177-82. Naghibi F, Mosaddegh M, Mohammadi Motamed S, Ghorbani A. Labiatae family in folk medicine in Iran: From ethnobotany to pharmacology. Iranian J Pharm Res 2005; 4: 63-79. Balick MJ, Cox PA. Plants, people, and culture: the science of ethnobotany. Scientific American Library series 60. New York: Scientific American Library, 1996; pp. 2-3. Ghorbani A. Studies on pharmaceutical ethnobotany in the region of Turkmen Sahra, north of Iran (Part1): General results. J Ethnopharmacol 2005; 102: 58-68. Hamilton AC, Pei Shengji, Kessy J, Khan Ashiq A, Lagos-Witte S, Shinwari ZK. The purposes and teaching of applied ethnobotany. People and Plants working paper, 11. WWF, Godalming, UK, 2003. Cotton CM. Ethnobotany: Principles and applications. Chichester: John Wiley and Sons, 1996. Khafagi IK, Dewedar A. The efficiency of random versus ethno-directed research in the evaluation of Sinai medicinal plants for bioactive compounds. J Ethnopharmacol 2000; 71: 365-76. Sairafianpuor M. Iranian medicinal plants and antiparasitic compounds: from ethnobotany to contemporary scientific evidence. Ph.D. Dissertation, Department of Medicinal chemistry, Royal Danish School of Pharmacy, Copenhagen, Denmark, 2002; pp. 36-49. Posey DA. Commodification of the sacred through intellectual property rights. J Ethnopharmacol 2002; 83: 3-12. Hooper D, Field H. Useful plants and drugs of Iran and Iraq. Field Museum of Natural History. Botanical Series 1937; 9: 71-241. Shokri M, Safaian N. The study of medicinal plants in mazandaran (northern Iran). Acta Hort (ISHS) 1993; 333:165-74. Miraldi E, Ferri S, Mostaghimi, V. Botanical drugs and preparations in the traditional medicine of west Azarbaijan (Iran). J Ethnopharmacol 2001; 75:77-87. Yesilada E. Past and future contributions to traditional medicine in the health care system of the Middle-East. J Ethnopharmacol 2005; 100: 135-7.